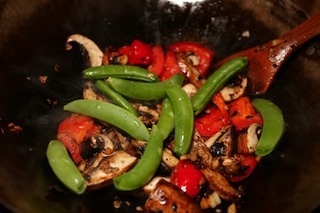 Now we add the snap peas to the wok. When we add fresh ingredients to the wok in this style of one-pot cooking, we usually let the sit on top of the ingredients already cooking in the wok a bit before we stir them into the mix. This keeps things cooking without dropping the heat of the cooking ingredients because we added new veggies (possibly still cool from the refrigerator). The brief time while they sit on top of the cooking ingredients gets them warmed up without cooling off the cooking ingredients already well cooking in the wok. We cover and let cook for 30 seconds or so.